Hi everyone! I am Taslima Irine Ivy from Bangladesh. I currently teach at University of Dhaka in the Applied Linguistics and English Language Teaching (ELT) stream. 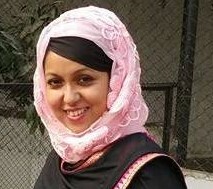 I completed my MA in Educational Technology and TESOL at the University of Manchester and my BA in English at University of Dhaka. My research aims to find out how the use of multimedia can promote sustainable learning in Bangladeshi EFL classrooms. The Government of Bangladesh had initiated a project titled Access to Information (a2i) with one of the objectives to promote sustainable learning (more comprehension and retention as a result of learning by doing/interaction) with the help of multimedia, as opposed to the traditional approach of passive learning through lectures. However, a pedagogical analysis of a2i EFL multimedia classrooms (done in my M.A. dissertation) found no substantial qualitative (pedagogical or learning) difference with non-multimedia EFL classrooms. As an observer, based on previous research in the field, it was easy for me to recommend that a learner centered pedagogic practice (pedagogy which aims to engage students in cognitive interaction) needs to be adopted instead of a passive one to achieve the aim of promoting sustainable learning through multimedia. I came back to Bangladesh, submitted a report to a2i and started teaching again. It all started from one of my writing classes which was to be observed by a senior academic from UK. I ‘delivered’ my lecture with the help of the PowerPoint. The projector screen had to be pulled down in front of the whiteboard. However, when my observer discussed that by projecting the slides in front of the whiteboard we at the department might be blocking a vital platform (the whiteboard) for student interaction in the class; it suddenly struck me! In my MA thesis I myself had pointed out that EFL multimedia classrooms were quite linear and we needed to move towards multimedia induced cognitive and pedagogical interactivity. Then how could I not see that I was using the PowerPoint to only project the lecture and not using the interactive features at all? My pedagogy, the PowerPoint, my knowledge of cognitive interaction and my context were at war with each other. But why? That is exactly when a2i officials called up and asked the same question, why was their teacher training not working? And what could be done to promote student centered learning in multimedia classrooms the government had set up? My MA thesis had identified the problem but what could be done to achieve a solution for the context of Bangladesh? Frankly speaking I did not have the answer myself! I knew the answer may be found through further research in context and hence the application for a PhD and commonwealth scholarship. I will be working with a2i teachers across the country and try to find a contextually appropriate solution for achieving a sustainable pedagogical shift in a2i as well as my own multimedia EFL classrooms. The commonwealth scholarship result is due end of May so fingers crossed! Super to know you are joining us soon Taslima, and congratulations on the Commonwealth Scholarship. We look forward to welcoming you to our community and hope to ‘meet’ you in the LANTERN Summer Event. By the way,Taslima is looking for advice on finding a flat and a school for her daughter, so if anyone can help out, please get in touch with Taslima.